Quell your workout woes As a bodybuilder, finding the right supplement to increase power output can be a difficult task. It can be challenging to conquer your workout woes while building muscle, increasing strength, and boosting endurance. It requires a complete formula to reach your main objectives. ProteinCo Beta-Alanine is the solution for enhanced performance, quick muscle building, and high intense training. With this powerful product, you’ll see massive muscle gains, and produce significant results, allowing for a better state of health and wellness. Delays Fatigue Carnosine helps controls the acid buildup in your muscles during high intense training. The acid causes muscles to fatigue, but ProteinCo Beta-Alanine is able to maintain high workloads, and increasing hypertrophy. Improves Sports Performance With its ability to absorb hydrogen ions, and help with high intensity workouts, ProteinCo Beta-Alanine gives you a powerful combination for enhanced results. This product displays an increase in stamina, muscle size, power, so you can improve performance—whether you are at the gym, basketball court, weight room, or football field. Maximum Results Considered a powerful amino acid, Carnosine quickly flows into the muscle fibers. Compared to other supplements, ProteinCo Beta-Alanine is able to maximize its firepower to overcome fatigue, strength woes, and endurance struggles. This unique formula is able to maintain maximum strength during high training sessions, and enhance muscle gains---so you can feel, look, and be at your best. ProteinCo Beta-Alanine contains 2,500 mg of Beta-Alanine to help you overcome fatigue during high-intense training. This powerful muscle-building formula boosts endurance so you can train harder and longer. ProteinCo Beta-Alanine makes a compound called Carnosine---which is a potent amino acid that helps stabilize ph levels, so you can enhance your energy levels. This product is designed to help you delay muscle fatigue for optimal performance. ProteinCo Beta-Alanine will help improve strength gains, and provide you with increased muscle mass. If you are lacking energy in the weight room and finding it difficult to overcome fatigue, then ProteinCo Beta-Alanine is your answer. ProteinCo Beta-Alanine will help you sustain long, grueling workouts---resulting in quick, massive muscle gains. As a bodybuilder, you know your limits. Though most bodybuilders have high-energy workouts, your training sessions have been lackluster. You have a tendency to fatigue quickly, and you are faced with unique challenges. It’s time to build muscle-mass quickly by training fiercely. ProteinCo Beta-Alanine is your answer, as it contains 2500 mg of this potent formula. This powerful supplement provides huge muscle gains, and enhances your ability to boost endurance. Improve High-Intense Workouts High-intense exercise causes an accumulation of hydrogen ions, and causes your muscle ph levels to drop, which builds up lactic acid. It’s the release of these hydrogen ions from lactic acid that causes muscular fatigue. Carnosine is an amino acid found in ProteinCo Beta-Alanine. This amino acid helps control and combat muscle ph levels, allowing you to workout at high levels for longer periods, so you can quickly build muscle. Increase Strength Gains With the increased bouts of high-intense exercises, ProteinCo Beta-Alanine allows you to boost your overall strength. This helps you perform successfully at athletic performances, so you can overpower the competition, no matter your current state of athletic ability. Sustained Endurance for Enhanced Results Since ph levels in the muscles are low during high bouts of training, this causes lack of physical strength and intensity. Though only available through ProteinCo Beta-Alanine, Carnosine helps balance ph levels, so you can train at a high level for longer periods of time. The increased endurance allows you to enhance quality workouts---so you can see quick, effective results. Q – How to Reduce Lactic Acid? A – Since Lactic acid is water soluble, it is important to stay hydrated, as it is less likely it is to cause lactic acid build up. If you can try and aim to drink 16-20 ounces of water before your workout and 10 ounces every 30 minutes, this should help you reduce lactic acid from intense exercise. It is also vital to stay in good physical shape, because the less glucose you have in your body, the less lactic acid will be in your body. Another component to keep in mind is to stretch after your workout. This will help release lactic acid, reducing muscle soreness or sensations that may you be suffering from. As far as nutrition, magnesium is important to help give the body energy that is transported to the muscles. This will reduce the lactic acid buildup to ease discomfort levels. You can intake a magnesium supplement or eat products that are high in magnesium such as spinach, pinto beans, legumes, and pinto beans. Vitamin B is also important to help fuel muscles because they send glucose to the body. This helps fuel the muscles during intense workouts, which reduces lactic acid. Foods that are high in Vitamin B include cereals, peas and beans, vegetables, and protein foods such as fish, dairy products, and eggs. Q – What are some natural foods to boost endurance? A – One food that is powerful to help boost endurance is Quinoa---which has significant amounts of protein and carbohydrates. These foods contain nine essential amino acids, which is paramount to the function of the body. Qunioa is a high source of Magnesium, Iron, Zinc, and Potassium. You can mix this grain with any type of food---any part of the day. Another power food is Kale. This green, leafy vegetable is important boost energy and endurance. It contains Magnesium, Folate, Zinc, and Iron. Also known to bolster endurance is bananas. They contain high levels of Potassium, and they are the ideal food to consume after an endurance workout. Filled with complex Carboydrates and Potassium, this reduces cramping, soreness, and helps to boost energy before a strenuous exercising. Premium Quality - Strict manufacturing standards and certifications: With its ability to boost stamina, Beta-Alanine offers an energy-enhancing formula that is manufactured to pharmaceutical grade specifications. We manufacture under strict GMP procedures to ensure the quality you require. 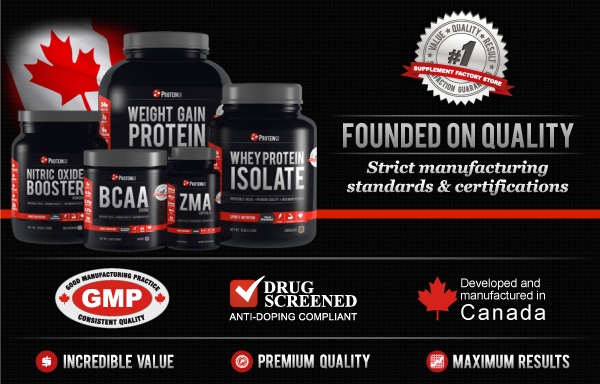 Our quality preserving processes means ProteinCo Canada’s features a powerful formula of 2500 mg of Beta-Alanine, which promotes athletes, workout gurus, and bodybuilders trying to enhance endurance during vigorous training. Enhanced Results with ProteinCo Beta-Alanine It’s a real bargain with 300 grams of powerful powder. This supplement will quickly transform your health, energy levels, and endurance and allow you to see enhanced results quickly. Whether you are a competitive bodybuilder, athlete, or an everyday fitness buff trying to change his or her fitness lifestyle, ProteinCo Beta-Alanine will give you increased power output for enhanced results. You don’t have to suffer from low-intensity workouts anymore. Instead, put your trust in ProteinCo Beta-Alanine. Personalizing Try with water or juice or your favorite beverage. Pre Workout Protein Co Beta-Alanine is designed to be consumed before training and competition. If you desire an energy boost prior to your workout, consume a 1/2 scoop of ProteinCo Beta-Alanine for quick results.